What’s your keyboard’s worst enemy? Spilled coffee? Crumbs or other bits of food (or indeed dust) getting stuck under the keys? Fear not, because Apple is on the case and looking at developing a crumb-resistant and spill-proof keyboard for the MacBook. The patent further notes that it relates to “structures that prevent ingress of contaminants such as dust or liquid into keyboards”. 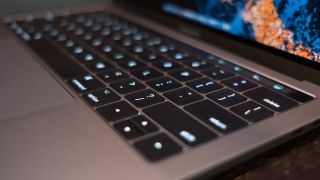 Apple describes a diverse range of solutions to make a keyboard effectively bulletproof to these dangers, which include the likes of gaskets, flaps, brushes or wipers which are designed to block the gaps beneath key caps. The firm also mulls about utilizing a full membrane layer under each key to keep contaminants from reaching the innards of the machine. There are some pretty innovative concepts discussed, including using a key press to effectively exert a ‘bellows’ effect, using the air to push out crumbs and dust from under the key. And the possibility of redirecting the MacBook’s fans to ‘blast’ contaminants away from the keys is also mentioned. Another example theorizes a keyboard which emits an ‘electrostatic discharge’ to drive away dust and the like. There are a lot of different ideas here, and it’s perhaps not surprising to see Apple is exploring how best to shore up its keyboard against the ravages of crumbs. It's been a well documented issue with the MacBook Pro, with dust seriously interfering with the butterfly switch mechanism. Possible keyboard innovations don’t stop here, though. As we’ve seen recently, another patent showed Apple is mulling the idea of giving the MacBook a virtual OLED keyboard. And back at the end of 2016, there were rumors of MacBooks getting e-ink keyboards with the ability to morph keys into different characters. Of course, remember that these are all just patents and concepts which may never see the light of day, but clearly, just going by the sheer weight of the various ideas being juggled by Apple’s research labs, making a better keyboard is something the firm is seriously concerned about. And hopefully we’ll see the fruits of that labor sooner rather than later.